Step 2. Set the VaRLevel to 99%. Step 3. Display the Portfolio property for information about migration values, ratings, LGDs, and weights. Step 4. Display migration values for a counterparty. Step 5. Run a simulation. Step 6. 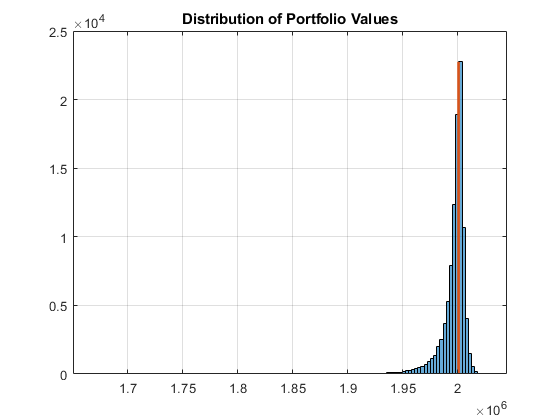 Generate a report for the portfolio risk. Step 7. Visualize the distribution. Step 8. Overlay the value if all counterparties maintain current credit ratings. Step 9. Generate a risk contributions report. Step 10. 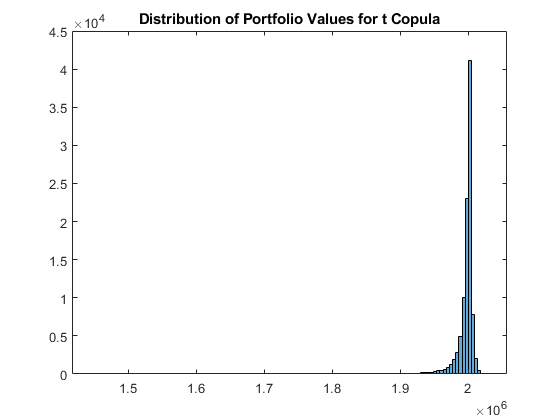 Simulate the risk exposure with a t copula. Step 11. Generate a report for the portfolio risk for the t copula. Step 12. Visualize the distribution for the t copula. Step 13. Overlay the value if all counterparties maintain current credit ratings for t copula. This example shows a common workflow for using a creditMigrationCopula object for a portfolio of counterparty credit ratings. Create a creditMigrationCopula object with a 4-factor model using creditMigrationCopula. Set the VarLevel property for the creditMigrationCopula object to 99% (the default is 95%). Display the Portfolio property containing information about migration values, ratings, LGDs, and weights. The columns in the migration values are in the same order of the ratings, with the default rating in the last column. For example, you can display the migration values for the first counterparty. Note that the value for default is higher than some of the non-default ratings. This is because the migration value for the default rating is a reference value (for example, face value, forward value at current rating, or other) that is multiplied by the recovery rate during the simulation to get the value of the asset in the event of default. The recovery rate is 1-LGD when the LGD input to creditMigrationCopula is a constant LGD value (the LGD input has one column). The recovery rate is a random quantity when the LGD input to creditMigrationCopula is specified as a mean and standard deviation for a beta distribution (the LGD input has two columns). 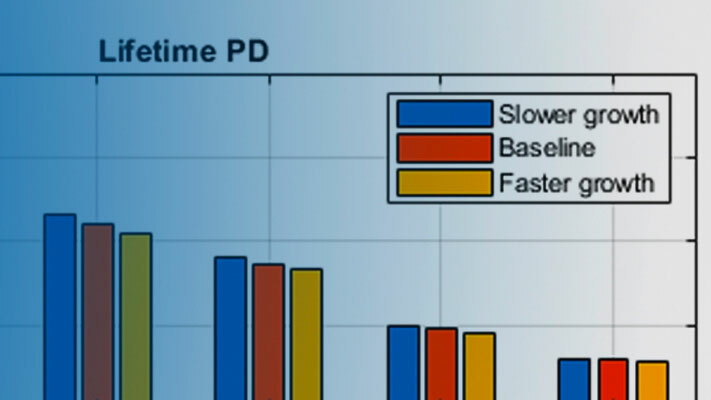 Use the simulate function to simulate 100,000 scenarios. Use the portfolioRisk function to obtain a report for risk measures and confidence intervals for EL, Std, VaR, and CVaR. Overlay the value that the portfolio object (cmc) takes if all counterparties maintain their current credit ratings. Use the riskContribution function to display the risk contribution. The risk contributions, EL and CVaR, are additive. If you sum each of these two metrics over all the counterparties, you get the values reported for the entire portfolio in the portfolioRisk table. To use a t copula with 10 degrees of freedom, use the simulate function with optional input arguments. Save the results to a new creditMigrationCopula object (cmct). Overlay the value that the portfolio object (cmct) takes if all counterparties maintain their current credit ratings.